Southern California has a wealth of wine tasting opportunities. No matter where you are in Southern California, you probably have a nice tasting event coming up in the next few days in or near your neighborhood. Let’s fire up the GPS and get off the well-traveled trail to explore a few hidden gems of Southern California wine tasting. Rosso is a small but interesting wine store which carries not only the expected Italian, but also French, Spanish and California wines that are hand picked by the owner. “Everyday wines that won’t break the bank” is how it’s summed up on the website. Rosso’s website is a worthy read, because it contains links to corkage fees for a number of Southern California restaurants, a list of Farmers Markets and a slew of wine region maps. Rosso’s tastings are held on Fridays and Saturdays under expert guidance. Any questions you may have will be answered in knowledgeable fashion. The tastings generally only cost $10. By the way, if you’re hungry when you stop in, La Cabanita Mexican Restaurant is just two doors down. Bag two birds and only park the car once. Wine tasting is not so much an event here as it is a natural occurance. As long as the store is open, so are the wine bottles. There’s a different menu each week which changes on Tuesdays and usually costs in the neighborhood of $12 to $15. Each Sunday they offer a different bubbly by the glass. Fine wines, micro-brewed beer and artisan cheeses are revered at this full-service wine store. It’s a good place to know about the next time you’re in beautiful downtown San Dimas. Michael and Alison Koth started from scratch with this little dream of theirs, and they have made it blossom into an integral part of their community. Tastings are held Fridays, Saturdays and Sundays, and most are themed. Relax in The Map Room, get a cheese plate if you like, and take a tour of a wine region, variety or style. There’s no hurry, by the way. The tastings last for hours. 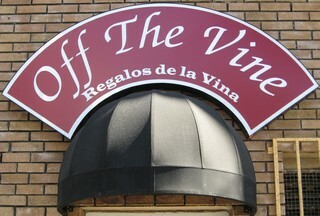 Off The Vine also offers occasional dinners, tours and cruises tailored for wine lovers. They have partnered with local restaurants that charge no corkage on wines purchased at Off The Vine, and even have a “Wine Tasting and a Show” promotion with an area theater! It’s a wine bar. No, it’s a wine store. Well, it’s both. Depends on which door you use to enter. 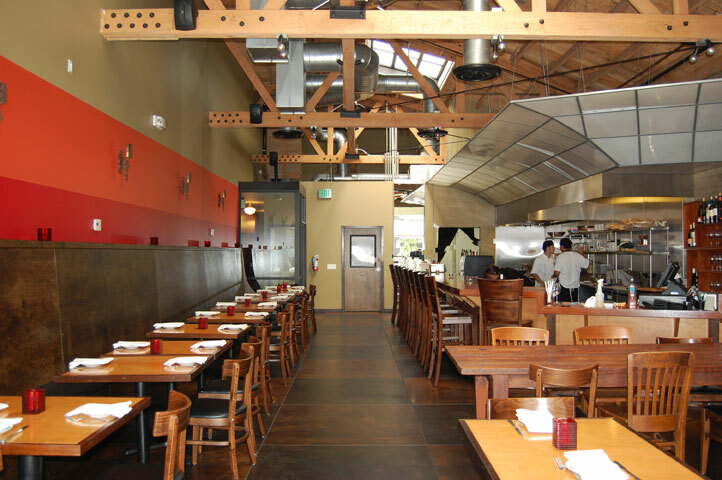 It’s actually more – it’s also a restaurant with some really fabulous food, and a wine storage facility, too. 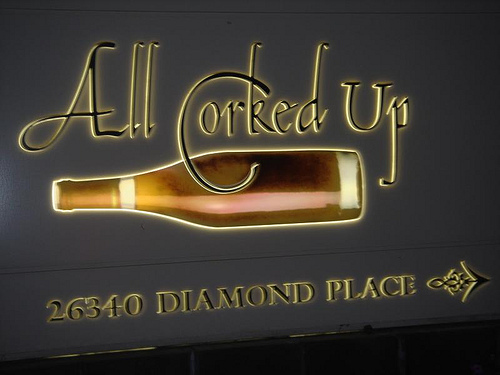 All Corked Up is hidden away, even by Santa Clarita standards. They’re in a business park and hidden from the view of the main road – you should definitely call for directions if you don’t know your way around. Once you find them, you’ll most likely be glad you went to the trouble. The bar area – up front – is upscale and comfortable. A long bar and a room full of tables offer plenty of space to relax, swirl, sniff and taste. In the back area is the store, where you can find bottles of the great wines you just tasted. There’s live music on a regular basis and special tasting events are never too far away. Be sure to write down the directions or throw down bread crumbs on your way there – you’ll want to return. No mistaking this place. It’s a full-bore wine store. They do pour a taste or two from time to time, though. Regular tastings occur on Thursday and Saturday afternoons, with more in-depth classes on most Friday and some Wednesday nights. The Wine Country’s website provides a clutch of information and even a Philosophy of Wine. In that lengthy treatise, the notion of wine made for the marketplace is rejected and a more terroir-driven product is embraced. It is this type of wine they strive to present in the store. In historic Uptown Whittier, Phlight is a wine and tapas bar near the intersection of Philadelphia and Bright. They serve daily flights of 3 wines for $12, 4 for $16. Their wines are excellent, with a list that looks to be about half Californian and half Spanish, Argentine and Australian. An occasional wine from Italy, Germany and New Zealand may show up on the menu, too. Visit their website and you’ll find that Phlight is the dream of an enterprising young couple who want to give something back to their hometown. It appears they are giving a lot, as Phlight has become quite the hotspot in Uptown Whittier. This entry was posted on January 30, 2010 at 1:53 pm and is filed under Uncategorized. You can follow any responses to this entry through the RSS 2.0 feed. You can leave a response, or trackback from your own site.